Charming Maui home, just steps from the pool and hot tub! A short walk to a lovely and quiet beach. This large 1 bedroom, 1 bath townhome is beautifully decorated in tropical decor. There is a King bed and A/C in the bedroom. There is a full kitchen, a full bathroom and in-unit Washer/Dryer, sofa sleeper, WIFI and HDTV. Located on a small property with just 54 condos and only 5 low-rise buildings. We have everything you need or want, including Boogie Boards, Coolers, beach chairs, A/C in the bedroom, and internet. Full Kitchen, Washer/dryer. Patio opens up to lush tropical vegetation. This condo has all new stainless steel appliances, a full-size front loading washer and dryer and is just steps from the largest condo pool in South Maui! This large 1 bedroom, 1 bath townhome is beautifully decorated in Hawaiian style decor. There is a King bed in the bedroom, along with two closets and an Air-Conditioner. There is a full kitchen, a full bathroom with a walk-in shower and in-unit washer/dryer. ​Want some fresh island fish? One of our favorites, Eskimo Candy Seafood and Deli, is also located about 1 mile from the property. Here you can take advantage of all that the ocean has to offer, including Ono Fish and Chips, Seared Ahi Wrap and their amazing chowder. Also nearby, you will find two grocery stores, as well as many other shops and restaurants. Need coffee? Starbucks and the Java Cafe are less than a mile away. 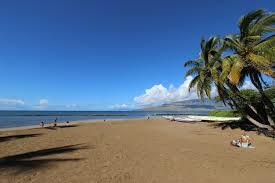 Located just across the street from Kalepolepo Beach Park, guests enjoy a short walk to the ocean. This townhome comes equipped with a boogie board and two beach chairs, as well as pool/beach towels. All linens and towels are provided, as well as a selection of supplies to get you started (toilet paper, paper towels, etc). Koa Resort has many great features, including cabana (complete with ping-pong table, FREE WIFI, and lending library), tennis courts, plus a LARGE heated swimming pool that features a hot tub and poolside shuffleboard court.